Easy to transport with a folding mechanism. Lockable for 45°- and 90° angles. 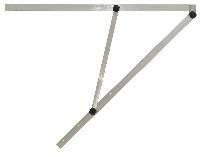 The angles can be locked for 45° and 90° and are therefore guarantee a perfect initial angle for your constructions. The big square is used in outdoor areas for the measurement of pavings, wood- or stone terraces, wall or fence constructions as well as for installation of bounds. The big square is also useful indoors for adjusting floor coverings and the measuring of frame works. The square made of 8 mm strong aluminium is solid, inflexible and nevertheless easy to transport. The squares are collapsible and have of a transport lock.